Although associated with breakfast, eggs serve a variety of functions in the culinary world. Since chicken eggs are the most common type of egg consumed, the recipes in this article are for cooking chicken eggs. Goose, duck and quail eggs can be prepared in similar manners, but cooking times may vary. Although hard-boiled eggs are the most familiar iteration of boiled eggs, soft- and medium-boiled eggs also fall into the same category. Hard-boiled eggs can be turned into pickled eggs by brining them in a way similar to making pickles. Hard-boiled eggs are the basis for deviled eggs, where each egg is sliced lengthwise, the yolks removed and mixed with additional ingredients, then assembled by filling the cavity with the mixed yolk. In a large saucepan, gently place the eggs and fill the pan with water up to 1 inch above the top of the eggs. Bring the water to a full, rolling boil. Turn off the heat and let the eggs sit for two to four minutes for soft-boiled eggs, six to eight minutes for medium-boiled eggs, and 10 to 12 minutes for hard-boiled eggs. Drain the water from the pot and rinse the eggs in cold water to stop the cooking. Older eggs tend to peel easier after boiling. A simple way of cooking eggs in the oven is cracking an egg in a ramekin --a small ceramic bowl -- adding flavorings and baking for 10 to 15 minutes at about 375 degrees Fahrenheit. Flavorings for baked eggs include cheese, cream, bacon, greens and onions. Scrambling eggs resembles sauteeing vegetables. Heat oil or butter in a frying pan or skillet over medium heat, crack the eggs into the pan and season with salt and pepper. Stir, breaking up the egg yolks as the eggs begin to form curds. Continue scrambling the eggs until the eggs are no longer liquid in form. Scrambled eggs are considered soft, medium or hard based on how much liquid egg remains after cooking. 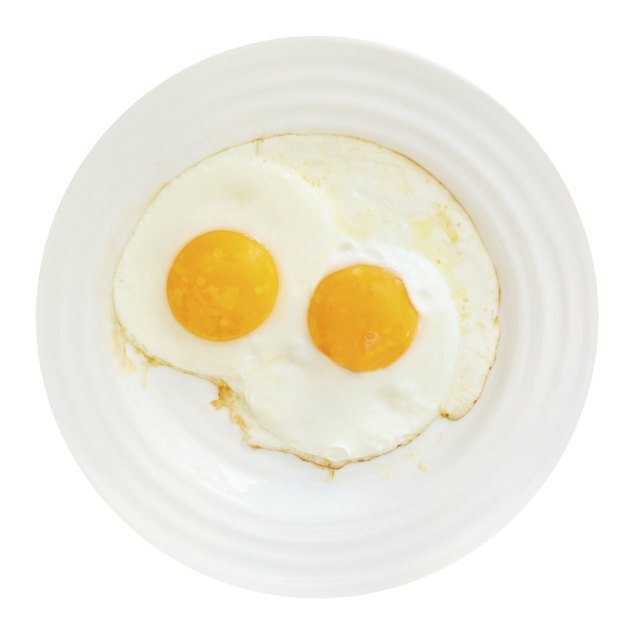 Fried eggs are prepared similarly to scrambled eggs but the whites and yolks are not broken or mixed together. Heat oil or butter in a frying pan or skillet over medium heat. Crack the eggs into the center of the pan, ensuring the yolks remain intact. Cook for about three minutes for sunny-side-up eggs. Covering the pan and using the trapped steam to cook the eggs reduces the amount of time required. Flipping the eggs and adding cooking time turns sunny-side-up eggs into over-easy, over-medium or over-hard eggs, depending on the consistency of the yolk. A fried egg variation is the Mexican dish huevos rancheros, where a tortilla is slathered with tomato-chile sauce and topped with fried eggs. "Poaching" means simmering in liquid. Heat water or broth in a saucepan to a simmer, season with salt and 1 tablespoon vinegar, stir to create a whirlpool effect in the center of the pot, and crack in the egg without breaking the yolk. Turn off the heat and let sit for 5 minutes , then remove with a slotted spoon. Serve immediately. Variation: shakshuka is a Mediterranean dish of eggs poached in tomato, chili peppers, and onion. Egg-drop soup may be compared to scrambled poached eggs in broth. French toast is cooked similarly to fried eggs. Fried rice bears resemblance to scrambled eggs. Omelets are cooked as fried eggs.